For adding support when mounting JMI EV, NGF (1.25" and 2") or RCF focusers on Sonotube (cardboard) or wooden optical tubes. (Will not work with the EV-75 Upgrade.) The 0.075" thick aluminum plate can be easily curved or flattened as needed. 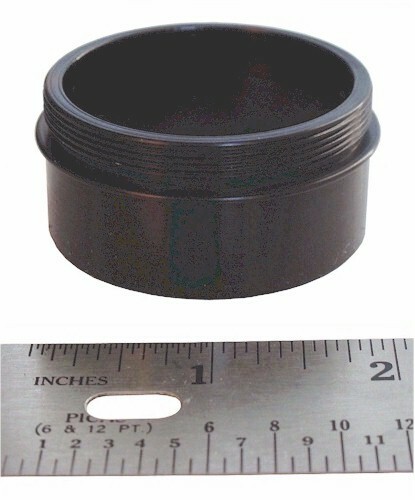 Adapter for inserting 1.25" accessories in a 2" drawtube. The adapter uses a compression ring to secure inserted equipment. It includes a slot on the 2" outside surface for securing the adapter in a drawtube with a compression ring. It also includes standard 48mm filter threads. (This adapter is a standard accessory with EV-1n, EV-2n and Ev-3n focusers.) See the Adapter Comparison Chart. Our 1.25" Eyepiece Adapter (shown), T-thread Adapter and Enhanced Extension Tubes include a compression ring for holding eyepieces and accessories without scratching the equipment. The adjusting screw presses against the ring which tightens around the eyepiece or accessory. 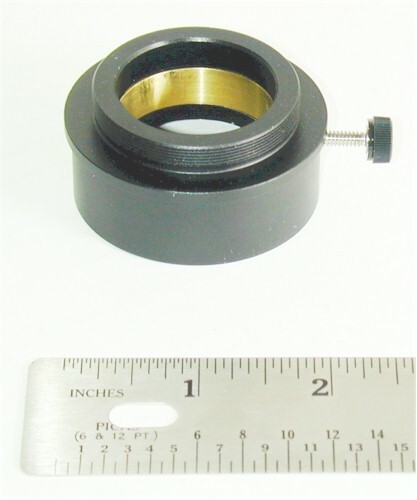 Adapter for mounting a CCD or other camera, with a standard T-thread, into a 2" drawtube. It also doubles as a 1.25" adapter. A T-adapter holds a CCD camera more securely than a standard 1.25" adapter. The adapter uses a compression ring to secure inserted equipment. It includes standard 48mm filter threads. See the Adapter Comparison Chart. Enhanced extension tubes include a compression ring and 48mm filter threads. See the Adapter Comparison Chart. Standard extension tubes do not include a compression ring or filter threads. See the Adapter Comparison Chart. NOTE Since JMI focusers are low profile, you may need extension tubes to reach focus after converting from a high profile focuser (longer drawtubes are also available) or to alternate between visual and photographic positions. Enhanced Extension Tubes come in three sizes. 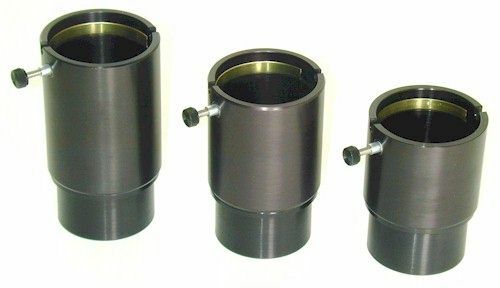 All three are for 2" drawtubes and include a compression ring (see below) and filter threads. The extension lengths are 2.13", 2.63" and 3.13". Standard Extension tubes come in three sizes. Two for 2" diameter drawtubes and one for 1.25" drawtubes. 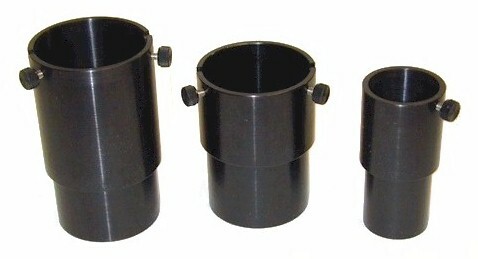 The Enhanced Extension Tubes include a compression ring (just like the EV drawtube shown at left) for holding eyepieces and accessories without scratching the equipment. The adjusting screw presses against the ring which tightens around the eyepiece or accessory. Standard SCT threaded output for inserting into a 2" drawtube. 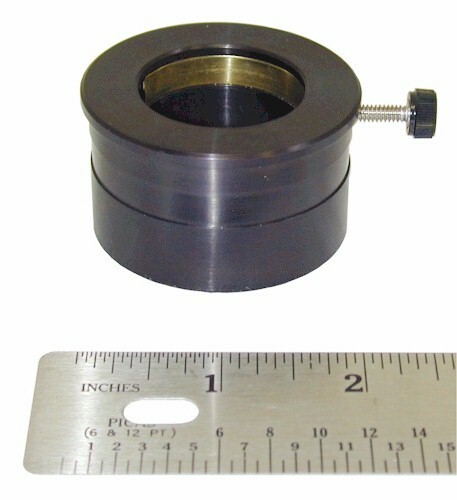 This adapter duplicates the standard 2"-24 threads found on a small SCT allowing standard SCT accessories to be attached to the output of any 2" focuser. An indentation on the side (in combination with a compression ring) makes it resistant to falling out when using heaving equipment. It also includes 48mm inside filter threads. (This adapter is a standard accessory with EV-1c, EV-2c and EV-3c focusers). See the Adapter Comparison Chart and the Refractor Diagram. These adapters give output of standard SCT threads. The first fits into a 2" drawtube and the second fits into a 1.25" drawtube. 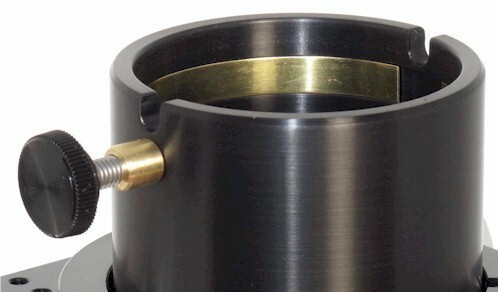 This adapter allows attachment of standard SCT accessories on the output side of a focuser. 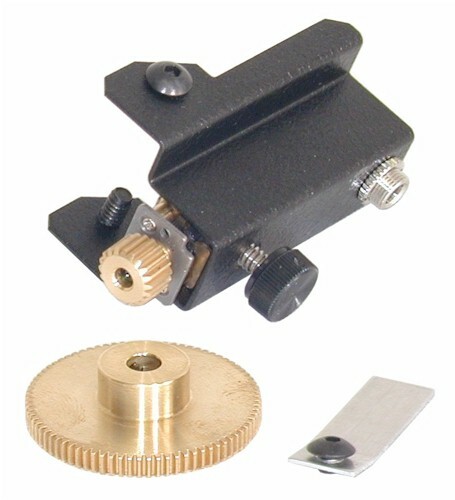 With this adapter you could even mount a JMI focuser on the back of a refractor. The EV focuser's modular design means that you will NOT need to return the focuser for an upgrade. Extension tubes are placed in the end of a drawtube to extend the length of the drawtube. If you have replaced a high-profile focuser with a low-profile model, an extension tube may be necessary to reach focus. A longer drawtube is another option to consider. Extension tubes can also be useful for alternating between visual and photographic positions. JMI sells standard and enhanced extension tubes. The enhanced version includes a compression ring for holding equipment without scratching the surface. The adjusting screw presses against the ring which tightens around the eyepiece or accessory. 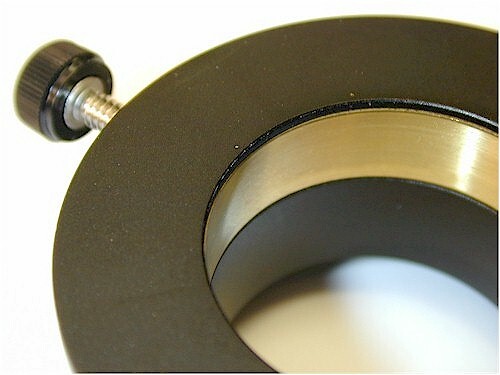 Filter threads are also included in the bottom of the extension tube for holding 48mm filters.